When is the ideal time to start your child on the path to a comfortable and mostly satisfying career as a developer? High school? Grade School? Fisher-Price thinks preschoolers should be introduced to the problem solving skills they might one day need to be a great coder. 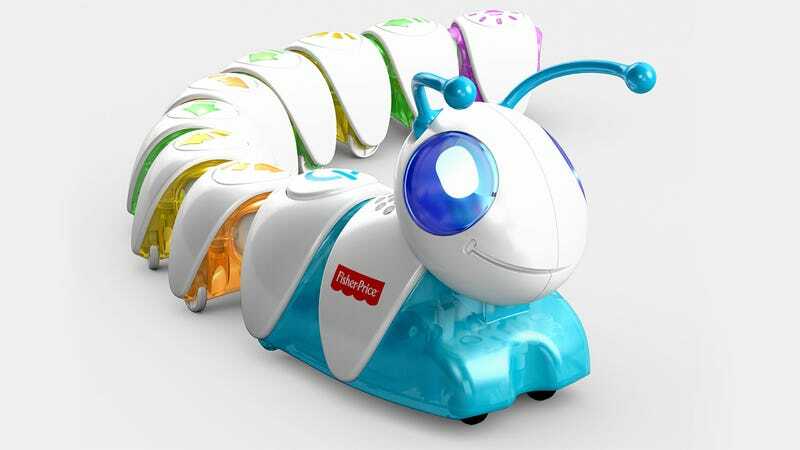 To help parents accept that developing apps for a smartphone might soon replace Sesame Street as their child’s favorite pastime, Fisher-Price has gone and named its new coding toy the Think & Learn Code-a-Pillar. Aw, we can’t stay mildly disgusted at the idea of you! More info on the toy will be made available come Toy Fair in February, but what we know now is that the various segments of the Code-a-Pillar’s body double as action and directional commands. So how a child arranges them in sequence changes how the Code-a-Pillar will roll around a room. It’s programming at its most rudimentary, but Fisher-Price claims the toy builds the basic skills needed to understand more complex programming languages later in life. The Think & Learn Code-a-Pillar also connects to a free companion app, which proposes additional programming challenges for kids to solve as they get older.